Presiding Officer Norma L. Gonsalves recently attended Boy Scout Troop 351 Eagle Court of Honor for Brian Dobkowski which took place at Merrick Golf Course Clubhouse Banquet Hall. Brian, a resident of Merrick, undertook a project to restore the Parish Center at the Sacred Heart Roman Catholic Church in North Merrick. Brian painted the exterior and replaced multiple windows and doors to the building. He also organized the installation of new landscaping for the church grounds. 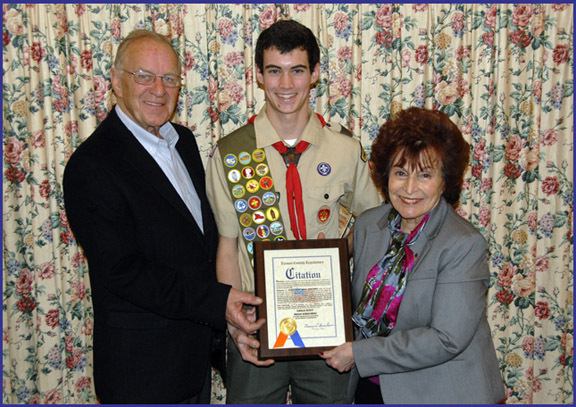 Pictured (l-r): Assemblyman David McDonough; Presiding Officer Norma Gonsalves; and Eagle Scout Brian Dobkowski.